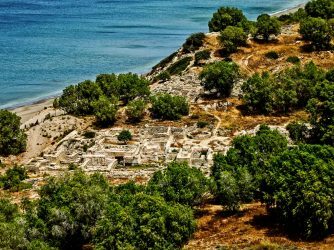 Situated on a hilltop overlooking the Gulf of Messara in south-central Crete, the Minoan settlement of Kommos may reveal amazing secrets from the Bronze Age. However, as fabulous such new discoveries may be, the intersection of modern touristic products and the island’s heritage are brought into sharp focus today. With untold Minoan Civilization discoveries still unearthed, Crete’s beaches and other touristic offerings represent a real crisis dynamic and a public dilemma. The good news is, a new preservation and public access initiative by Heraklion parliamentarian Nikos Igoumenidis and Greece’s Minister of Culture Lydia Koniordou may pave the way to remedying these cultural points of pain.